Baby picture posting etiquette: Parents can’t control their children’s digital footprints. Who really controls your child’s photos? This article is part of Future Tense, a collaboration among Arizona State University, New America, and Slate. On Nov. 20, Future Tense will host “Will the Family Survive the Revolution in Reproductive Technology?” in Washington, D.C. For more information about the event and to RSVP, visit the New America website. Brianna considered herself a fairly active social media user, and at one point she had about 1,000 Facebook friends. But she wanted to guard Abigail’s privacy as well as give her daughter the chance to shape her own online presence. Unfortunately, children today won’t have that luxury—they will inherit their digital footprints. Just as parents’ genes and child-rearing techniques help shape a child’s identity, parents’ digital habits will construct their children’s online identities, at least until children are old enough to take the reins. I interviewed Brianna and 21 other mothers as part of a research study with University of Michigan School of Information professor Sarita Schoenebeck that examined the decision-making process to post baby pictures online. While most mothers felt comfortable sharing pictures of their children online, many also expressed concern over their inability to control where that information went. 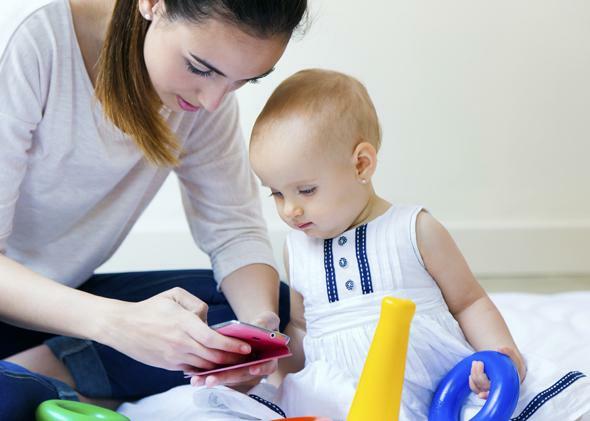 These 22 mothers by no means represent the experiences of all parents, but their insights provide a starting point to consider how parents’ use of digital technology can affect their children. I sympathize with Brianna’s position because she was unable to carry out one of the first parenting decisions she made. But one thing is clear: Control is no longer an effective paradigm to evaluate the relationship between privacy and information. When your baby pictures appear on Instagram, Dropbox, Gmail, and Grandma’s phone, who really controls them? The terms of service and privacy policies that govern these tools evolve constantly, and absolute control over information is impossible, even for experts. Not to mention that newborns have no control over their pictures being taken in the first place. Focusing on control over information made sense when people kept physical photographs. In a pre-Web age, the pictures of you splashing in the bath or smearing birthday cake on your face sat in albums or shoeboxes, viewed only when Mom pulled them out of the closet. When these pictures appear online, they reach a much broader (and potentially unknown) audience, and people can easily make copies of the pictures. This also means that other people can use baby pictures in unintended, potentially disturbing, ways. For instance, Fast Company recently discussed the alarming “baby role-playing” subculture, in which people take photos of kids from strangers’ social media accounts and pretend online that the children are their own. It’s tempting to suggest that parents shouldn’t post baby pictures online, but this ignores the very real benefits they experience from doing so. Sharing pictures online helped the mothers I interviewed feel connected with family and friends, which is especially important for parents whose friends and family don’t live nearby. They received social support and validation, which is helpful when dealing with loss of sleep and the overwhelming responsibility of caring for a tiny human being. For those who cherished their experience of motherhood, sharing pictures online created a record of those memories. Also, family and friends constantly ask to see more baby pictures, so parents may feel some pressure to share them online. At the same time, mothers recognized that by sharing pictures online, they were making decisions on behalf of their children that couldn’t be easily reversed. Eventually, their children would grow up and develop opinions about what they wanted their parents to share and not share online. Rather than seek to control their children’s digital footprints, parents can engage in what we call privacy stewardship. This means that parents should consider what types of information they feel are and are not appropriate to share about their children online and then communicate their preferences to family and friends. About half of the mothers in our study talked with their husbands about sharing baby pictures online. Two mothers included their sharing preferences in birth announcement emails. Rebecca asked people to avoid posting pictures of her daughter on Facebook, and Judy asked people not to post her son’s first name on Facebook. Nevertheless, it’s impossible to control other people’s actions. Judy’s mother-in-law sometimes posted her son’s first name in Facebook comments, and Judy sent her text-message reminders when that happened. Lindsay’s sister-in-law re-posted pictures that Lindsay had shared on her own Facebook profile, despite Lindsay’s preference that others not post pictures of her daughter online. Clara’s mother shared a picture of her son Ryan’s first bath on Facebook. Clara didn’t want naked pictures of Ryan to be online, but she didn’t say anything because she wanted to honor her mother’s decision. The experiences of these mothers illustrate the inevitability that even some information that parents don’t want online will likely find its way to the Web. Privacy stewardship acknowledges that sharing decisions vary from parent to parent. Parents can share a lot of information about their child online and still look out for their child’s best interest. Take Marina and Cara. Marina’s best friend maintained a popular YouTube channel with hundreds of thousands of subscribers, and Marina happily let her friend feature her son in a few videos. Cara created a Facebook profile for her son, and she posted pictures and videos that depicted the full spectrum of his developing personality, from acting cute to throwing a tantrum. While both mothers frequently shared pictures of their sons online, they did not share indiscriminately. Marina would not share a picture of her son crying because she wanted her friends and family to see him as a happy-go-lucky child. Cara once removed a picture she posted of her son eating a breadstick because she did not want people to interpret it as sexually suggestive. Raising a child is (and has always been) hard. Managing the online footprint of a child may feel like yet another task on an ever-growing list of parental responsibilities. But if parents let go of the idea of trying to control their child’s digital footprint and instead consider how to steward their child’s privacy, the task just might feel more manageable.